Loreto is known for its cobblestone streets and past shops selling pottery, which will have you feeling like somewhere between an old and new world. 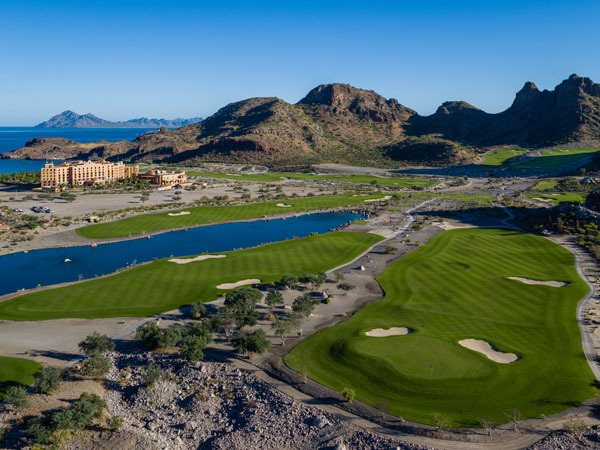 Villa del Palmar Beach Resort and Spa defines luxury and true relaxation with quiet beaches, scenic vistas, rich history and an astounding natural habitat in the middle of Loreto. Set within Danzante Bay and the indigo waters of the Sea of Cortez once dubbed “The aquarium of the world” by Jacques Cousteau, the resort offers 4,447 acres of unspoiled beauty including mountain views, three outstanding restaurants, five swimming pools, tennis courts, and a highly acclaimed golf course. Guests can choose from a deluxe suite, one, two or three bedroom suites, or luxury penthouses with stunning views of Danzante Bay. Each room is tastefully decorated with modern forms and shapes with natural pure elements, to form a spectacular home away from home. Rooms are equipped with a walk-in closet, LCD TV, walk-in steam shower and oversized tub with a choice of king or queen size beds. Take advantage of the waters with activities such as snorkeling, fishing, kayaking, sailing, scuba diving, whale watching or simply just floating around on the Sea of Cortez. The vibrant reefs house an underwater spectacle of marine life that is a sight not to be missed. Above the water is a sea of bright green plant life, exotic colorful flowers and the beauty of old buildings filled with history. Visitors marvel at everything Loreto has to offer including hiking and biking trails with nature tours for perfect photography opportunities. After a long day of exploring, visit The Market Restaurant where the Mediterranean meets America meets Mexico in a casual buffet-style eatery, where diners can choose from a huge range of menu options. The establishment offers both inside air-conditioned and al fresco seating in a sophisticated and coastal style. Casa Mia allows diners to sit before beautiful mountain and ocean scenery while sipping on a cocktail and enjoying a succulent meal at Casa Mia. The picturesque eatery offers everything from wood oven pizzas, to fun tacos, sandwiches, salads and more. For dinner, swap out the flip flops for high heels and a little black dress for a fancy evening out at Danzante Fine Dining steakhouse and seafood restaurant—with a Mexican flare. This classic atmosphere offers an amazing culinary experience devoted to fusion cuisine made with seafood, fresh fish, and fine cuts of meat to blend together in a dazzling array of Mexican cuisine at its finest. The restaurant also offers a large selection of Mexican wines and the adjoining bar features a large variety of cigars for guests to choose from. If you’re looking to unwind, Sabila Spa and Wellness Center is a relaxing environment with generous selection of specialty healing treatments within its ultra-luxurious facility. Visitors will tantalize their sense with a plethora of traditional and modern treatments including aromatherapy, body scrubs, facial treatments, body wraps and couple’s massages.